Normanton Church is situated at the edge of Rutland Water, the largest man-made lake in the UK. Originally called Empingham Reservoir, the lake is one of many that were brought into being since the late nineteenth century to provide water for an ever-increasing population. Lying near Oakham in the county of Rutland, the reservoir was completed in 1977 and now covers an area of 3,100 acres. Rutland Water is available for recreational purposes as well as providing water for domestic and industrial use. To make Rutland Water it was necessary to flood a large part of the parish of Empingham. Sadly, this meant the destruction of some local communities. Both the village of Nether Hambleton and Middle Hambleton were cleared. The river Gwash and several others were diverted to provide the water needed to fill the reservoir. At its maximum, Rutland Water is thirty-four metres deep, while the crest of the dam is 1,200 metres long. Once constructed, various areas were designated as sites for recreational use. Small marinas, parks and restaurants were built around the edge of the reservoir, making it a very popular centre for leisure activities, especially in the summer. Rutland Water is the largest man made lake in the UK. The western part of the reservoir has been set aside as a nature reserve but visitors can see great numbers of waterbirds all over the lake throughout the year. Now classified as an Area of Special Protection, it is the wintering place of rare Gadwell and Shoveler Ducks. This is the perfect place for anyone who loves nature and wildlife and wants to see wild creatures in their natural habitat. Hides are available so the birds can be watched without being disturbed. Birdwatchers flock to Rutland Water! And especially in the summer, now that it is home to the first ospreys to breed in England in 150 years. 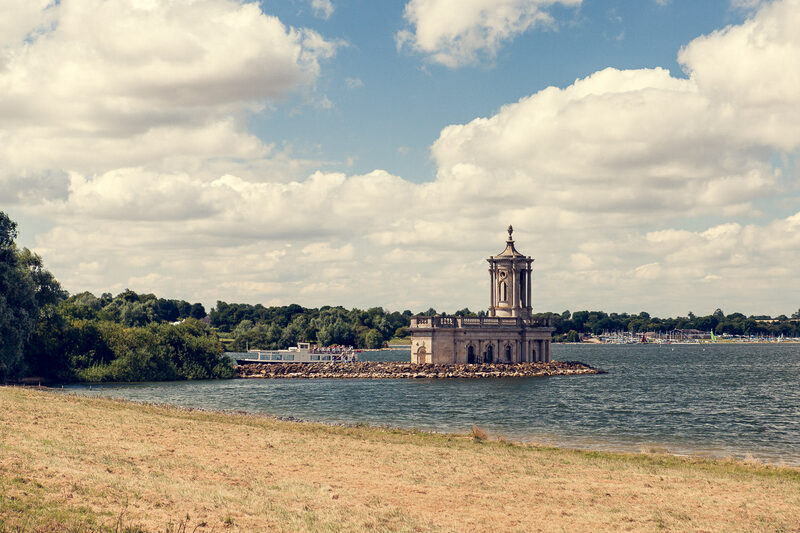 Situated in 4,200 awe-inspiring acres of beautiful, verdant countryside in England’s smallest county, Rutland Water Park is a major leisure attraction, offering activities to suit all members of the family. On the shore of Rutland Water the Visitor Centre, cafés, restaurants and gift shops have plenty to keep you occupied; or perhaps you would prefer to go cycling or walking. In that case you can take advantage of the 25-mile track that circles the area and enjoy the gorgeous landscape, as well as the fresh air and exercise. You don’t even need to bring a bicycle; you can hire one when you arrive. For people who love the water various activities are available at the Watersports Centre and sailing clubs. The eastern end of the reservoir has been set aside for windsurfing and sailing, while the middle section is a great place to try your hand at some trout fishing. If you want you can join other visitors for a trip across the lake in the pleasure cruiser Rutland Belle. Of course, you can merely sit, relax and admire the view. Enjoy a picnic and take some photographs. Whatever you do, you will soon feel at peace with the world in this beautiful, rural setting. Imagine, if you will, the dismay of the inhabitants of Nether Hambleton when they were told of plans to flood the Gwash valley where they and their families had lived for centuries. Then would have come the awful realisation that this would mean not only the loss of their homes but of their livelihoods as well. However, the ever-expanding population of South East England meant an increasing demand for fresh water had to be met and this idyllic and rural part of Rutland was chosen as the perfect location for a new reservoir. Hambleton is thought to have been the capital of Rutland’s Anglo-Saxon kings. It exists today as Hambleton village but once comprised three parts: Upper, Middle and Nether (or Lower) Hambleton. When the valley was flooded in 1976 to create Rutland Water (known to begin with as Empingham Reservoir after the Parish of Empingham that surrounds it), only Upper Hambleton and part of Middle Hambleton were left and these are now known as Hambleton. Nether Hambleton – also called ‘the lost village’ – is now under the water, a small community of houses and farms abandoned forever and frozen in time. Hambleton is situated close to a Dark Age meeting place for Anglo-Saxon administrative districts known as wapentakes. The three large estates of Hambleton, Oakham and Ridlington once formed the Wapentake of Martinsley. By 1086, the Domesday Book recorded Hambleton as being a village with a population of 750 people, three priests, three churches, one mill and forty-five ploughs. The village later held a weekly market and an annual fair. Nether Hambleton itself was once a sizeable settlement during the Medieval period. Now, sadly, all that remains of its former glory is the splendid structure known as Normanton Church. The Old Hall, built in 1611, and a few houses on the lower slope of Rutland Water are all that’s left of Middle Hambleton. Hambleton village today can boast around sixty houses. It has the thatched roofs and old stonework so typical of a very old English village and is surrounded on three sides by a beautiful rolling landscape of trees and fields. On the other side, of course, is the largest reservoir in England. Normanton Park Hotel was once the stable block of Normanton Hall. When Sir Gilbert Heathcote bought this estate in Rutland in 1729, the existing country house of Normanton Hall fell into his possession. The hall was later rebuilt by his son during the years 1735-1740. The estate was sold off in 1924 but the mansion itself could not be disposed of as a complete lot. The fixtures and fittings were auctioned in 1925 and the empty shell of the building was demolished – all but the former stable block. Now a three-star hotel, Normanton Park Hotel stands in five acres of beautiful gardens and parkland on the shore of Rutland Water. Being close to the A1 and M1, it is easily accessible. As a wedding venue, it is very conveniently situated for any couple who want to have their wedding ceremony at nearby Normanton Church.